First unveiled at the Frankfurt Motor Show in September 2017, the new Renault Megane RS is set to arrive on Irish shores this summer. 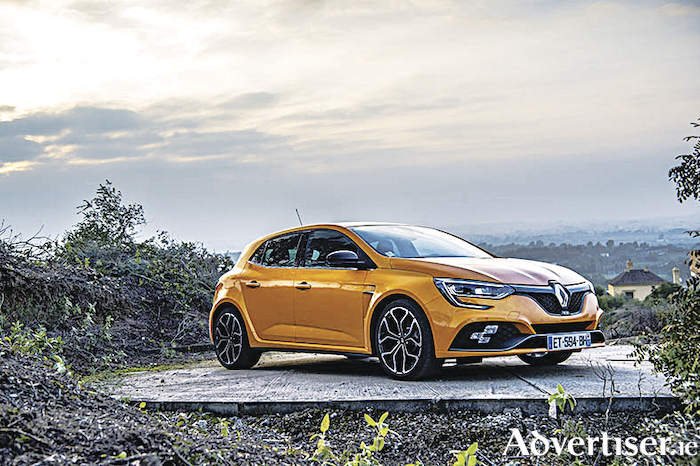 Just like its predecessors, the Megane RS is aiming to become a benchmark in the C-segment hot hatch market. Eagerly awaited by sports driving enthusiasts, this third generation model is packed full of Renault Sport expertise and passion. Driven by its powerful design and focused on performance, the new RS makes no attempt to hide its motorsport pedigree, offering outstanding driving pleasure on the road and on the track. Unique in class ‘4Control’ four-wheel steering system ensures stability at high speeds and agility at low speeds. And at high speeds, the front and rear wheels turn in the same direction, limited to a one degree angle for the rear wheels and at low speeds, the front and rear wheels turn in opposite directions up to a maximum angle of 2.7 degrees. In addition, the hydraulic bump stops all round enable optimum control of tyre-ground contact and increased ride comfort. The world’s most powerful 1.8-litre engine promises to deliver 280hp and 390Nm of torque, thanks to the development work jointly carried out by engineers from Renault Sport Cars and Renault Sport Racing. There is also the option of an efficient dual clutch (EDC ) gearbox for the first time, alongside a manual transmission. Two types of chassis are available – Sport or Cup. The Sport chassis provides easy sporty driving, with best-in-class efficiency, while the Cup chassis offers greater sports performance for track and fast road use. The new RS ‘monitor expert’ allows drivers to film their track sessions (not speeding on public roads ) and overlay telemetry data to create augmented reality videos that can later be analysed on the RS replay website. The unique RS vision lighting system, with chequered flag design, integrates the side lights, cornering lights, fog lights and high beam into one house in the front bumper. Finally, pricing for the new Renault Megane RS will be made available closer to the on-sale date of early summer 2018.